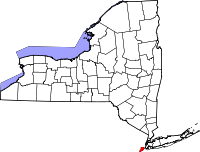 Richmond County, or as it's more commonly known, Staten Island, is a borough of New York City and the city's least populated. The Staten Island Historical Society has a huge number of records both online and at the New York Public Library system. The Society website is broken down into easy to navigate categories and includes cemetery records from the mid 1700s to the mid 1900s, immigration and naturalization records from the early and mid 1600s to the late 1800s, vital records such as births, deaths, marriages, and baptism from the mid 1600s to the mid 1900s, legal records such as probate and property transactions from the late 1700s to the mid 1900s, and much more. All of it is provided free of charge and is available for researchers to view and print any time. The Staten Island County Clerk also maintains historical records and provides an online database search system that contains a large portion of the property records the office has on file.